We often talk about how our diets affect our fitness - but we don't discuss how they affect the hungriest organ in the body, the brain. And it has surprising dietary needs that differ from the rest of our body. Brain Food uses cutting-edge research to highlight the connection between nutrition and our brain's health, busting through pseudoscience and demonstrating how we can all change our diet most effectively. Based partly on her own discoveries, and using emerging science, for example on the connection between the brain and the gut, Dr Lisa Mosconi, an expert in both neuroscience and nutrition, reveals the foods and drinks that can prevent dementia, stress, cognitive decline and memory loss - no matter how old we are. Start reading Brain Food: How to Eat Smart and Sharpen Your Mind on your Kindle in under a minute. Lisa Mosconi is the Associate Director of the Alzheimer's Prevention Clinic of the Department of Neurology at Weill Cornell Medical College, and was the founder and director of the Nutrition and Brain Fitness Lab at New York University. She holds a dual PhD degree in Neuroscience and Nuclear Medicine from the University of Florence, Italy, and is a certified integrative nutritionist and a board-certified, holistic healthcare practitioner. We know a lot less about how food works than you might believe. It's great to see scientists starting to turn their cutting-edge work into useful, usable recommendations for how to become healthier through the food we eat. Many food recommendations tally with other books from very different scientific study areas (such as The Diet Myth). 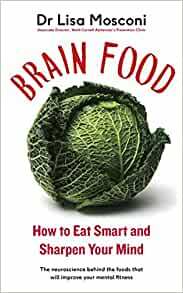 What's great are the chapters looking at the brain and cognition specific nutrients that we need (including phenylalanine, tryptophan, glucose, phospholipids and choline) plus good, easy recommendations of how to incorporate into your diet. Disappointing, nothing new presented here and, it appears, aimed at Americans who often choose to eat an appalling diet of chemical laden adulterated rubbish washed down with endless carbonated soft drinks and don’t see the connection to their failing health. Dr Mosconi perpetuates the cholesterol myth and appears to believe in calorie controlled diets (need to apply the second law of thermodynamics and recognise how the body responds to different food groups - what you eat is more important than how much). There is useful information in the book but not sufficient to make it a ‘must have’ book as there is too much padding out with diet advice. She talks a lot about the “Mediterranean diet” which is open to interpretation. For her, being Italian, that means a predominately Italian diet but a tour of the countries around the Mediterranean will show a huge difference in what people consume. To many the link to a Mediterranean diet starts with Ancel Key’s investigations and what he thought was a Mediterranean diet based on a study of people in Crete, however he collected data during a fasting period (religion related) so it wasn’t valid. simple but mouth watering recipes with boat loads of research to back them up. what more could you want? to be clear, the majority of the book is the science, written in beautifully flowing non-technical language, and the recipes are at the end, but i love being able to oscillate between the two. It's probably silly, but as I get older, I worry more about my brain. It's fantastic to learn that I can attend to my brain's health by changing my diet, and, especially, by eating stuff I quite fancy eating anyway. This is a smart, useful and engaging book about an important subject. Highly recommended. Some fantastic and mind blowing information about the nutritional value of foods and their effects on the body!! Didn’t put the book down for a few days. - The only thing I wasn’t keen on was the self-references to blog posts/websites all the way through, it made it seem more like an opinionated piece than one based of scientific evaluation and balance! Based on solid clinical research. Comprehensive. Readable. Practical. Brings a lot of ideas together under one roof. Wish I’d known this lifestyle guide 20 years ago. 5.0 out of 5 starsBrilliant, would give 6 stars if I could! Really good science based research, explained in a user friendly way. Definitely a better way to improve mental acuity.